The assault on the 45th president began immediately following Donald J. Trump's victory in the 2016 presidential election. It was then that Democrats concocted the absurd story of Russian spies and international plots as an excuse for Hillary's humiliating defeat. 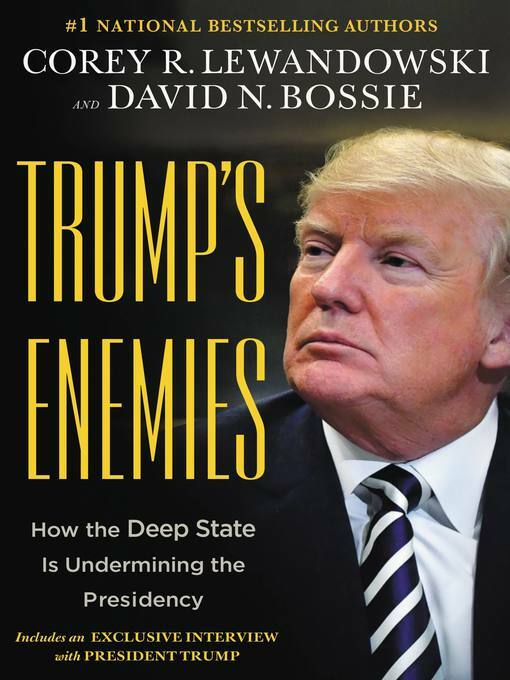 Using unparalleled, behind-the-scenes sourcing from inside the White House and on Capitol Hill, and access to the president and other key players, Trump's Enemies offers a never-before-seen look deep into the forces aligned against the president. Lewandowski and Bossie were present in Trump Tower and at Bedminster during the presidential transition and saw the events that gave root to the unelected "resistance" in the White House today. Bossie was witness to the moment the fake Russia investigation was enacted by James Comey, who legitimized the phony "Steele dossier" by presenting it to the new president-elect. A close confidant of the president, Lewandowski knows what goes on behind the West Wing walls as well as anyone. But Trump's Enemies is also the story of how President Trump is fighting back. In the face of a gale of media disinformation and the looming black cloud of Mueller's politically motivated investigation, President Trump has still managed to accomplish more than any of his predecessor in the short time he's been in office.